Just before QuiltCon, I agreed to a mini mini swap with Jane (@janequiltsslowly on Instagram). I asked her to remind me about this swap when I returned home, and she politely waited a few days which I greatly appreciated. Integration back into real life was not entirely smooth, and I was needing a lot more sleep than normal to recover some of the personal energy I had expended acting more extroverted than is normally my nature. Regardless, she and I agreed to do a bit of improv work with solids for one another, and she also said she wouldn’t mind a bit of “red herring” thrown in. Well, in my scrap box I had a bit of the red left over from Red Herring, so I started with it and scraps of a black through gray gradient to make some fabric with a think red line. Then I cut up the made fabric and pieced together her Mini Mini, which I have named Thin Red Line in my head. Once Jane’s mini mini was complete, I had a bit of the made fabric left over so I just turned it into a second mini mini to swap with a willing partner. Wabi-Sabi: “the art of finding beauty in imperfection…to see the singular beauty in something that at first does not appear obviously beautiful. Bringing wabi-sabi into ones life doesn’t require money or even special skills. It takes a mind quiet enough to appreciate muted beauty, courage not to fear bareness, willingness to accept things as they are. It depends on the ability to slow down, shifting balance from doing to being, to appreciating rather than perfecting”. There was so much there that resonated with me, and after an email discussion, we agreed to a mini mini swap with one another. 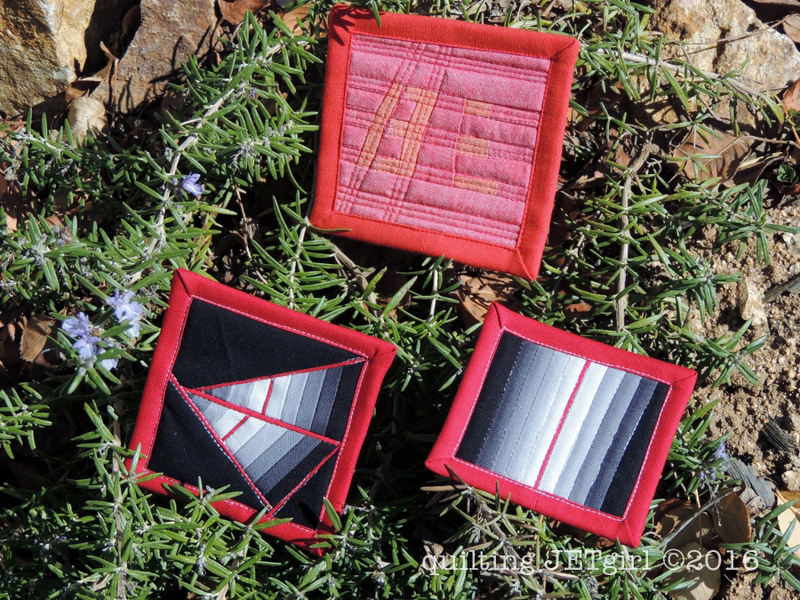 I was inspired by Wabi-Sabi, and incorporating some of Stephanie’s favorite warm colors into the design (Andover Chambray for the top, Cloud9 Cirrus Solid for the back and binding), I created the Wabi-Sabi mini mini quilt. 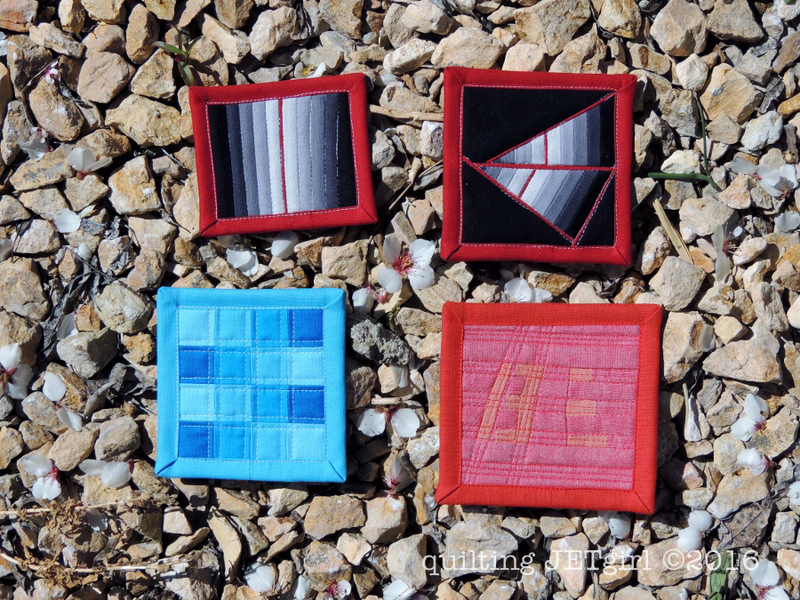 A bit more research that I did on Wabi-Sabi before embarking on the journey of making the mini mini quilt: Wabi-sabi is sometimes described as an ascetic of beauty that is “imperfect, impermanent, and incomplete”. 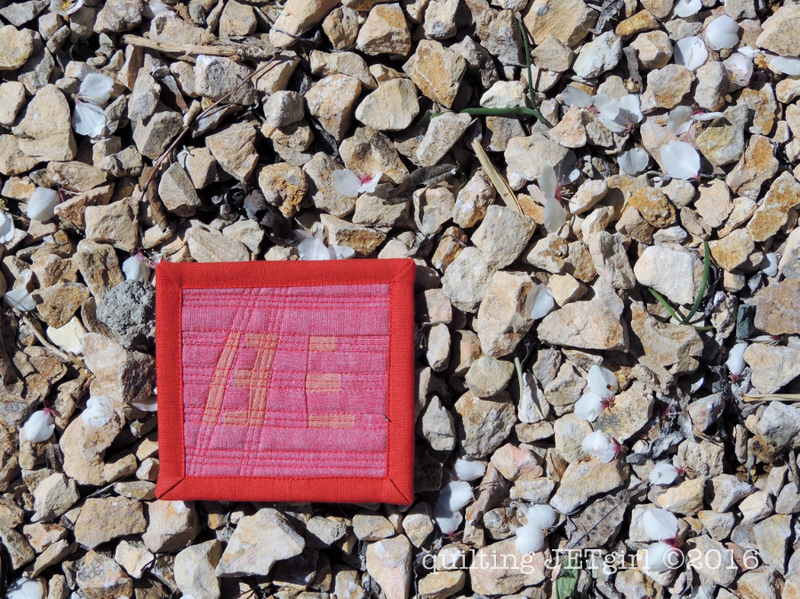 Wabi-sabi derived from a Buddist concept known as the three marks. The three marks of existence are 1. Impermanence 2. Suffering and 3. Emptiness. Awesome Yvonne! 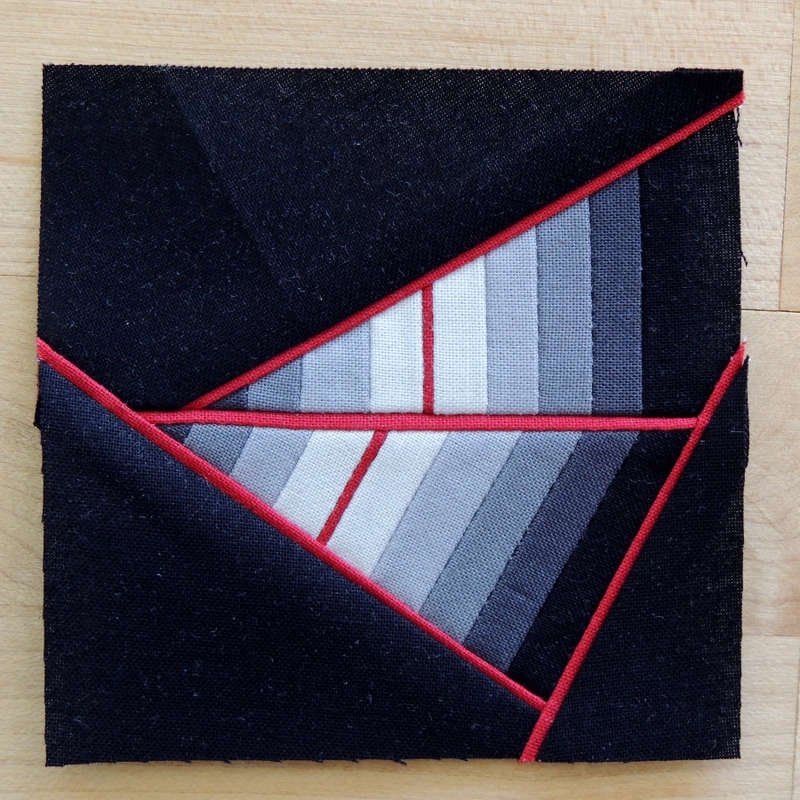 Love that angular black quilt! Your are building quite a collection of mini’s! 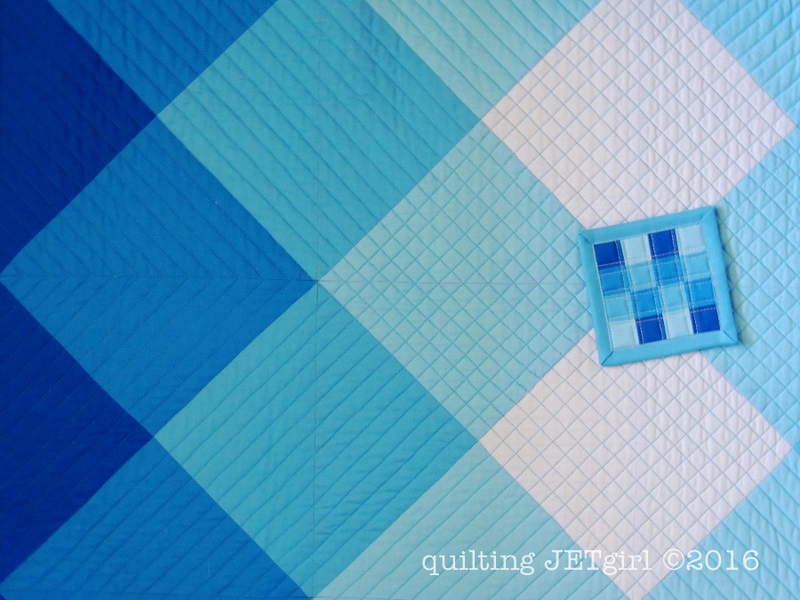 I like the blue mini on your original quilt. I have never heard of Wabi-sabi, thank you for sharing! You always have gorgeous mini’s and your wall is filling up fast! Love the thin red line with the grey! Thin Red Line – Beautifully done!!! That is amazing tiny work! I am not a fan of doing tiny work but I have to admit, looking at it absolutely fascinates me! So excited to see the Red Line mini mini in my mailbox!!! Thank you for sharing with me. Profound statement and concept. i really needed it today. As always, I think your mini-minis are wonderful, and I appreciate all the stories behind them. I try to make my projects with someone in mind and unique to the receiver. There are a few times when I do “assembly line sewing” but I still try to make small changes personal to each recipient. Good Morning Yvonne! As always, your mini mini’s are splendid! I especially liked the Thin Red LinePieced Top, using the tight satin stitch like you did added a wonderful element. Your wall is filling up fabulously quickly how spectacular for you! Thank you for sharing and have a fantastic creative day! Your mini-mini wall is too much fun! You put a lot of thought in your little pieces. Thanks for sharing Wabi-Sabi. I now have a short description for my usual crafting style. My hair too. I even have an old blog post that sort of talks about it. I think red line mini has to be my favourite of all the minis you have made so far. I had never heard of Wabi-Sabi thanks for the info. You may or may not have a wee addiction on your hands, Yvonne. But it seems pretty harmless! Not hard on the stash either! Beautiful minis! When I first saw the mini with the thin red lines I had assumed that was some sort of stitching then in the close up I saw that it was actually a super thin pieced in fabric, very cool! Ah man your wall is totally lacking a quilted paisley. So awesome! Each of these pieces is a work of art. 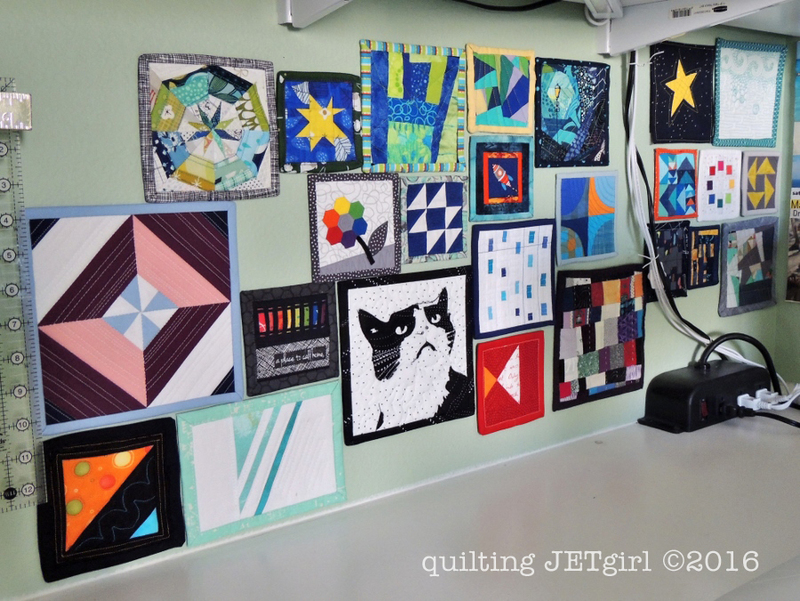 Love the photo of the two blue quilts – what a difference in scale. I love the pop of red that mine adds to your wall! These are super cute, and I loved the peek at your wall. I’m glad the ruler was on the edge to really see the scale. Your mini, mini wall looks amazing! How do you ‘stick’ them up? And I love the idea, and your interpretation of ‘wabi sabi’. LOVE the wall, the cat one reminds me of my boyfriends cat, sass and all! Love that thin line mini with the red. Those look like so much work!